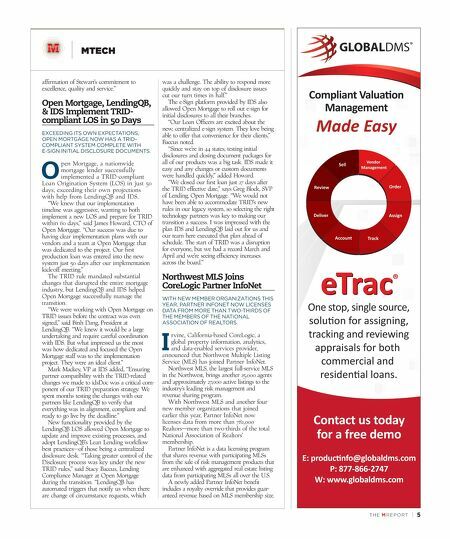 4 | TH E M R EP O RT MTECH DocMagic Launches 'eQC' Solution LENDERS AND CORRESPONDENT LENDERS ARE ABLE TO TRACK TRID COMPLIANCE WITH DOCMAGIC'S NEW SOLUTION. D ocMagic, Inc., a provider of fully-compliant loan document preparation, compliance, eSign, and eDelivery solutions, recently announced the launch of its fully integrated 'eQC' solution that automates due diligence for investors and correspondent lenders. The eQC solution provides a complete closed loan MISMO 3.3/ UCD XML data file, an automated compliance report, and a detailed audit trail with a document integrity certification that verifies the XML data and documents match prior to investor delivery. The automated compliance component of eQC includes a complete electronic record of compliance, arming investors and correspondent lenders with a detailed audit trail that eliminates concerns over future TRID audits and violations, according to DocMagic. "The CFPB requires all parties involved in the mortgage finance transaction to demonstrate evidence of TRID compliance," said Tim Anderson, Director of eServices at DocMagic. "Our new eQC solution gives investors and correspondent lenders warranted electronic evidence of compliance with TRID and other critical regula - tions, and ensures that the audited data is exactly the same data that appears on the documents disclosed to the borrower. This is really the holy grail of automated due diligence compliance." DocMagic noted that eQC also provides compliance data on federal regulations like high cost, QM, ATR, as well as applicable state regulations. It works by leveraging DocMagic's sophisticated audit engine, which determines if a condition is out of compliance. The audit engine immediately flags the causes of any issues for the user, directs the user to a link with information on where and how to fix it, and then verifies that the error was corrected. A full date and time-stamped audit trail is created by following a consistent data validation process that runs over 10,000 compliance rules and edits to verify and validate legal compliance throughout the loan origination process. In addition, this audit trail also provides full date and time-stamp tracking of all borrower disclo - sures, a complete record of the compliance checks and conditions performed on the loan, and the complete MISMO 3.3/UCD XML data file. The XML data file can be used to electronically board and re-verify compliance at any time in the future through a tool set API that enables high speed access to this due diligence functionality. "With over 8,000 originators running millions of closed loans through DocMagic's compliance portal each year, eQC leverages the long-standing industry acceptance of our compliance solutions to bring our correspon - dent lenders and investors true automated proof of compliance," said Dominic Iannitti, President and CEO of DocMagic. Stewart Valuation Services Receives Positive Ranking from Morningstar STEWART RECEIVED THE POSITIVE RANKING FOR ITS APPRAISAL MANAGEMENT AND VALUATION SERVICES. S tewart Valuation Services, LLC announced in mid-May that it has been assigned a 'MOR RV2' residential ranking with a positive forecast by Morningstar Credit Ratings, LLC. Stewart received this recogni- tion as a residential vendor in the asset valuation market. The assigned ranking reflects Stewart's dynamic workflow, imbedded quality control standards, regulatory compliance, and the organizational expertise in the managing process. Stewart is a provider of appraisal management services and valuations for the real estate lending industry. Products and technology are used by mortgage originators, default servicing organizations, home equity lenders, and capital markets. "Stewart is honored to receive this ranking from Morningstar," said Bill Sullivan, EVP, Valuation Services and National Sales, Stewart Lender Services. "Morningstar's thorough analysis is a direct reflection of the professionalism of our Stewart associates, our dynamic workflow controls, and the expertise of our staff appraiser and panel partners. 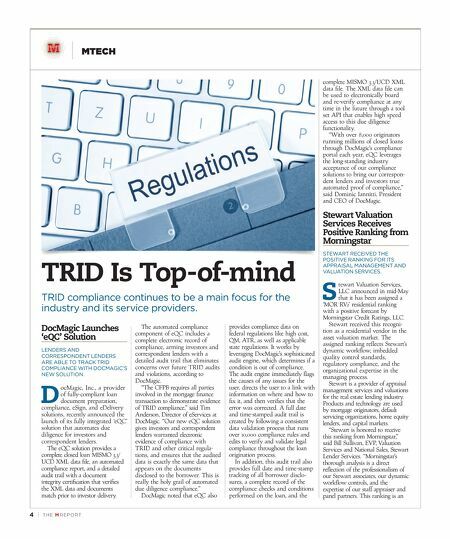 This ranking is an TRID Is Top-of-mind TRID compliance continues to be a main focus for the industry and its service providers.